Traditional Balkan recipe that will just blow you away! By the way there’s an interesting story behind this schnitzel. Modern version of this steak was invented by chef Mića Stojanović. There was a visitor from the Soviet Union, and chef needed to prepare Chicken Kiev for him, but there was no chicken around. So the chef used veal instead of a chicken. But, of course, and we understand him, he was not satisfied with a result, he poured a tartar sauce over it, and decorated with a slice of lemon and pieces of tomato. Well, at last he got the medal of the Order of the Star Karadjordje. 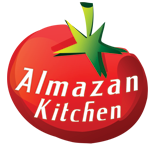 And now, it’s time to behold the AlmazanKitchen version! Tender deep-fried beef roll stuffed with premium homemade kajmak and cheese! Take homemade bread, cut in half. Warm near the fire. Take 500g of free-range beef. Cut it open andbeat the meat as thin as possible. Place 100g of kajmak and 80g of cheese on the meat. Take the homemade bread. It should be very dry right now. Make a bread crumbs. Take deep cookware. Flour it up. Place the meat into the cook ware, cover the meat with a flour. Put aside. Crack 2 eggs, scramble it well. Dip the meat into the eggs and cover it in bread crumbs right after. Repeat steps No. 11, 12 once again. Preheat your deep pan. Fill with oil. Fry the schnitzel until crunchy golden brown coating. My husband and I enjoy watching you cook and the great outdoors you cook it in. We also enjoy seeing Mr. Ramsey.